Olive oil is derived from crushed green olives. It contains sterols, phenols, fatty acids such as oleic acid, linolenic acid palmitic acid, and vitamin E that have significant antioxidant activity. Olive oil is also rich in monounsaturated fat that is beneficial for good health since it digests more easily compared to other types of fat. Olive oil is available in a variety of qualities and grades, which depend upon the methods involved in its extraction and the acidity level. Below are the most common types of Olive Oil. Extra Virgin Olive Oil: the best type of Olive Oil because it goes through very little processing without any heating or chemical treatment. It has the most antioxidant activity. Extra Virgin Olive oil has a very low smoke point. Therefore, it is not suitable for frying and cooking on high temperatures. Although, it can be used for light simmering on a very low heat. Virgin Olive Oil: comes second in quality. It is second grade Extra Virgin Olive Oil. Similar to Extra Virgin Olive Oil, it is good for only simmering and stir frying on very low heat. Pure Olive Oil: is also labeled as "Olive Oil" or "100% Pure Olive Oil". It is a combination of refined and extra virgin olive oil. It is good for cooking and frying on medium temperatures from 190°C/375°F -220°C/426°F. Olive Pomace Oil: is extracted from the pomace of the olives. It undergoes significant refining and chemical processing. Therefore, it is considered low quality compared to Extra Virgin Olive Oil. However, Olive Pomace Oil has higher smoke point and can be used for cooking and frying above the temperature of 230°C/445°F. Light Olive Oil: involves significant filtering and chemical treatment and has a very light olive taste. Lampante Olive Oil: is not an edible oil. It is sold for oil-burning lamps and industrial use. Olive Oil has a long history of medicinal and culinary use. It has been known for its anti-aging qualities in Mediterranean and Italian cultures. It is believed that nutritional and antioxidant properties of Olive Oil can help with many minor to serious health issues which may include intestinal disorders, coronary heart disease, bile and liver disfunctionality, inflammations, asthma, diabetes, cancer and high cholesterol levels. Studies have shown that exclusive use of Olive Oil, along with healthy and active lifestyle which includes regular physical activity, significantly lowered the cholesterol levels and reduced the risk of coronary heart disease. Further researches and studies are underway on the use of Olive Oil to cure cancer. The Vitamin E in Extra Virgin Olive Oil can strengthen brittle, chipped and weak nails. Simply mix one tablespoon of Lemon Juice with one tablespoon of warm Extra Virgin Olive Oil and dip your nails for 10 minutes before going to bed. Wrap your nails in thin cotton fabric or wear thin cotton gloves to let olive oil mixture penetrate in the nails overnight. Use this remedy regularly for at least one month to see gradual improvement in nail strength. Studies have shown that Extra Virgin Olive Oil can stimulate the production of digestive enzymes and improve bowel movement. Therefore, if you suffer from chronic constipation, regular use of Extra Virgin Olive Oil may cure the symptoms. Mix 1 teaspoon of Extra virgin Olive Oil in 1 teaspoon of lemon or orange juice. Drink it in the morning on empty stomach everyday until cured. For severe constipation, mix 1 tablespoon of Extra Virgin Olive Oil into a warm cup of milk. Drink it on an empty stomach. Olive Oil can stimulate the production of pancreatic lipase enzymes that help may improve the digestive system. For bloating, flatulence, upset stomach, heartburn and intestinal spasms, take one teaspoon of Extra Virgin Olive Oil half hour before every meal. The antioxidant activity of Olive Oil may help with high cholesterol levels and coronary heart disease. Studies have shown that the cultures and countries consuming Olive Oil on a regular basis have a lower percentage of patients with heart and cholesterol abnormalities compared to the ones who use regular vegetable oils. Therefore, a simple remedy for high cholesterol is to take 2 tablespoons of Extra Virgin Olive Oil daily. It is also advised to use Olive Oil as your every cooking oil instead of using vegetable oil. The essential Fatty acids, vitamin E and other nutrients in Olive Oil provide hair the nutrition and moisture it requires for healthy and strong hair. Massaging Extra Virgin Olive Oil into the hair and scalp stimulates blood circulation that improves brittle and thinning hair, dandruff, graying, and hair loss. Massage 2 tablespoons of Extra Virgin Olive Oil in hair and scalp for 10 minutes before you go to bed and wash it in the morning. Wrap your head with cotton fabric or a towel to protect the bedding from oil stains. Repeat this 3 times a week. Alternatively, you can make an herbal hair mask by mixing 4 tablespoons of warm Extra Virgin Olive Oil, 2 tablespoons of honey, and 1 teaspoon of cinnamon powder together. Apply this mask onto scalp and hair thoroughly before bath and wash it after 15 minutes. Repeat it 3 times a week. Olive Oil works as a natural emollient. Vitamin E and fatty acids in Olive Oil may help moisturize the dry skin and restore the natural youthful skin. It can penetrate into the skin's cell structure and strengthens the connective tissues. Thus, regular use of Olive Oil may reduce the appearance of stretch marks by making the skin more supple and pliable. Massage Extra Virgin Olive Oil into dry skin and stretch marks daily for at least a month to notice the effects. What are the Side Effects of Olive Oil? Olive Oil doesn't have any known side effects when consumed in moderation. 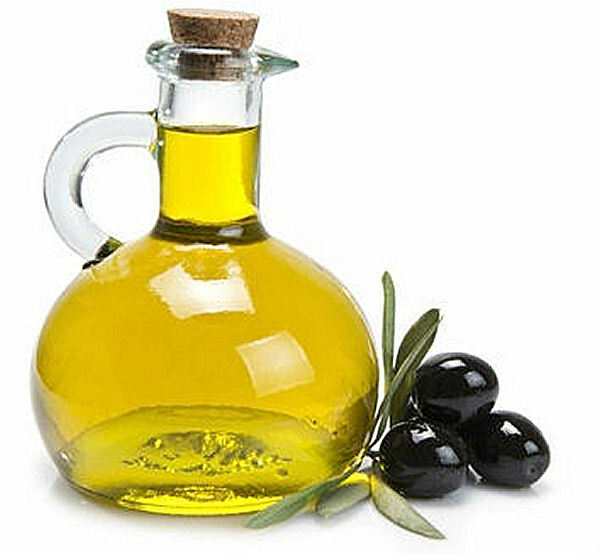 However, Olive Oil can cause abdominal pain in people with gallbladder disease. Due to the fat content of any oil, it is advised to be aware of the calorie count of Olive Oil when it is being consumed. The consumption of 2 tablespoons of Olive Oil accounts for 14% of our recommended total daily calorie intake. To benefit from Olive Oil's effectiveness, the oil should be stored in cool and dark places because heat and direct sunlight can make it rancid. Do not heat Extra Virgin Olive Oil more than 190°C because it can make Extra Virgin Olive Oil toxic and hazardous to your health. For frying, it is best to use Pure Olive Oil. Olive Oil can be bought at almost any grocery store. When buying Extra Virgin Olive Oil make sure that acidity levels are less than 0.8% and it is cold pressed, unrefined and unfiltered, and the colour of the oil has a green tint to it. When buying Virgin Olive Oil look for acidity levels less than 2% and for Pure Olive Oil it should be no more than 1%. Remember that the lower acidity levels, the better the oil is for our health. Find traditional home remedies to promote hair regrowth. @Alma, extra virgin Olive oil is not safe for cooking on high heat. Heating Extra Virgin Olive oil at temperatures higher than 190°C can make it toxic and hazardous for health. It should only be used for light stir frying or simmering on VERY low heat. However, pure and pomace olive oil can be used for cooking on higher heat. EVOO has many health benefits but I'm not sure, if it can help with bowel leakage. I use extra virgin olive oil for all my cooking, would that make me have a leaking bowel? I just had a colonoscopy and I am free of colon cancer for 7 years. I take 4 tbs of granulated coconut oil per day. Can I take the same amount of 100 percent virgin olive oil? I am using olive oil daily with warm milk, because I am suffering with kidney stone problem. I heard extra virgin olive oil is good for prevention of kidney stone. Can I cook garlic cloves into100% olive oil for a new born? I take olive oil after a fast and it gives me a headache. Can someone tell me why would it be? Can I take olive oil and coconut oil together?